This special selection of solid fat quarters gives you the palette of rich colors needed to make the MJ Kinman's January Birthstone Pattern shine! Rich reds and burgundy contrast with highlighting neutrals to make a stunning Garnet gem. 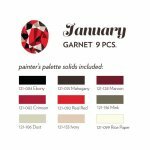 Shown: This fat quarter pack satisfies the fabric requirements for 'The Birthstone Series: January - Garnet' fat quarter pack, by MJ Kinman for Paintbrush Studio. January Bundle includes 9 fat quarters. Several months contain a few more fabrics. Those orders will be (advised); slightly more/less in price depending on number of fat quarters on average $ 3.20 ea. (Please contact us if you have queries or to quote on accurate price). Please Note: Some months contain more fabric colours...prices to be adjusted for those months.